Over the last few weeks, I (better known as Pastor Kara) have been preparing a study on prayer. But since I am a fan of technology, I am choosing to make some of the topics and discussion questions available to all who read this blog. Of course, one of the biggest gifts of gathering to study and reflect is that we sit around and talk about points of interest, ask questions as they arrive, and always learn more together. But this online posting (the first of a few) will strive to give you, the reader, at least a starting point for your personal reflection. Prayer is, quite simply, talking to/with God. We talk to God. We share our cares, our concerns, our thoughts. But we ideally talk with God. This means that not only do we talk, but we also leave space for a response. There are no right or wrong words to speak when we pray. In fact, some of the best prayers are those times when we lack words. Paul wrote in his letter to the Romans that the Spirit prays for us with sighs too deep for words to express (8:26). Think of your reaction when you see something spectacular (like a fireworks display – whether man-made or God’s lightning). What is it that you say? Or how about when you see someone hurting? How do you react? What noise do you make when you are frustrated? Angry? Annoyed? Every reaction, every sigh conveys emotions and experiences that are part of our conversation with ourselves, with our neighbors and with God. Being in communication is more than the words we speak; we also include the unspoken and nonverbal. And since is prayer is by definition communicating with God, even our gasps of awe, groans of pain and sighs of frustration are prayers. Draw a picture of your prayer(s). Stick figures are perfectly acceptable. In fact, if your work of art looks like it belongs on the fridge, you’ve done well! The Book of Psalms is one of the best resources for prayers in the Bible. The 150 psalms each have their own special message to be shared. These are both prayers and songs. Many hymns sung in church are based on the psalms, but you can also pray them silently or spoken aloud. Read the Psalms 4, 88 and 145 SLOWLY. As you read the psalms, pay attention to words and phrases that stick out to you. What rings true? Also, pay attention to your emotions as you read. Do you feel mad, sad or glad? Do the words lift you up or pull you down? – Psalm 4 – This is a prayer asking God to provide one of the most essential needs: protection. Note how the psalm begins: “Answer me, O God.” This is not a nice “Oh, when you get the chance…” This is a bold statement and (dare I say it) demand for God to take care of his child. The psalmist cannot even go to sleep without trusting that God will provide safety through the night. – Psalm 88 – This is the most despairing of all the psalms. Most psalms end with some form of blessing or praise to God. This one does not. This psalm remains “depressing” and very realistic about the pain the writer is feeling. One of the biggest gifts of this psalm (and others similar to it) is that we are given words to express our pain. We do not always have to be bubbling over with joy, especially when life is not joyful. – Psalm 145 – This is one of many “praise” psalms. Notice how this psalm talks about God and what God is capable of doing. But also, this is a psalm that invites the reader (and consequently speaker) to also declare what God has done and who God is. The next question we consider: How do we pray? One of the parts of prayer that we often overlook is what our bodies are doing as we pray. Think about your favorite prayer position. Are you standing, sitting, kneeling, laying down, walking around? What are you doing with your hands and arms? Are your eyes open or closed? Just remember, there is no right or wrong way to pray. But paying attention to how we pray can help us focus on our prayer. Try sitting still with your hands folded, head bowed, and eyes closed. How do you feel? Try standing up with your arms outstretched, hands open and eyes looking outward. How do you feel now? Try kneeling with your palms up. Or laying face-down on the floor. How do you feel? So many times we were taught that the “best” way to pray is to remain still and bow our heads. That is a position to focus us as we pray, and it can work for some. But it can also close us off. Sometimes we need to have our bodies open so that we ourselves are open for God’s message. This is why so many people feel closest to God while wandering out in nature, not closed up in a room with head bowed down. Recently, I learned a random fact: most of our brains are capable of doing 1.5 things at once. This means that as we talk with someone, our brain is a) listening to what is being spoken, b) helping us to think a reply, and c) doing something else (whether compiling a to-do list in your mind or showing as a physical movement). I think of this in regards to my “fidgety” fingers. While in the midst of a conversation (listening to words and thinking my response), my fingers are often busy playing around with whatever finds its way into my hands (jewelry, cell phone, pens, etc). I have also experienced shifting weight while standing, shaking my legs, doodling on paper, or tapping out rhythms. While many of us can find such motions distracting, for the person involved, such movement may be necessary in order to focus on the conversation. In regards to prayer, this means that we strive to use our bodies and our movements carefully and intentionally. This is why some people pray best while swaying. Others pray best while knitting or crocheting. Others paint, walk, or bake in order to focus while praying. Prayer involves all that we are (thoughts, speech, actions). There is no right or wrong when praying. The most important thing is that we pray. I hope that this helps you to think about prayer a little more than you might have before. If you have any comments or questions, please don’t hesitate to start a conversation. Today the adult discussion group from Trinity finished up their discussion on some women of the Bible. We had a chance to explore Sophia (Wisdom) & Eve, Sarah & Hagar, Jael & Judith, the woman at the well & the Syrophonecian woman, Elizabeth & the widow of Nain, and, finally, the women in Romans 16. These women had stories to tell. We knew them from the scripture passages that introduced us to them; but, we also learned that as women of flesh and blood their stories held more than just what was in print. And, as for Sophia, her story begins before time began. Both Jael & Judith were women of strong character who delivered their people from the enemy. Phoebe was a deacon and Junia was an apostle. Sophia (Wisdom) was with God in the beginning. Through these stories we learned that we have stories to tell as well. That all who gather to learn about the people of the Bible and read their stories have the stories of his/her own in his/her journey with God. Some of the women’s stories helped us to speak; some caused us to pause and look at our own lives; some will keep us wondering. Maybe during this Lent season you may find yourself wanting to explore the women of the Bible and through them take your own journey of discovery. Forty days of learning about them; forty days of learning more about yourself: who you are, and whose you are. 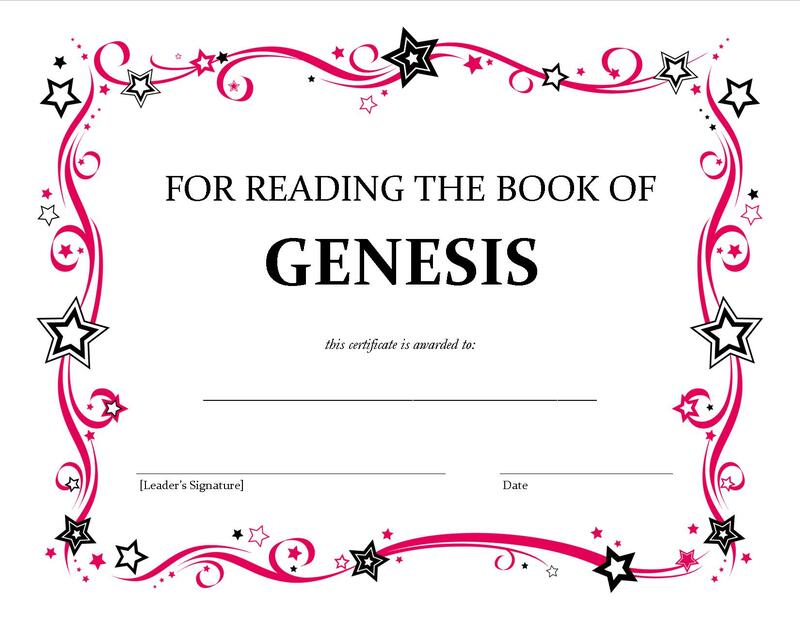 This morning at bible study in McVille, we completed reading through all 50 chapters of the book of Genesis. We started this journey back in early October and officially finished on Feb 15. That is 4 months of reading the stories and hearing how God was always at work with imperfect people prone to making stupid mistakes, and yet in the midst of their brokenness God was always at work and accomplishing what God intended to happen. Next week, on Ash Wednesday, we are going to start reading the gospel of Mark. For the church year, Mark is the gospel we focus on and read from. So we are going to sit down, read through it without jumping from story to story like in the lectionary, and take time to discuss what we are hearing and learning. Please join us either in person or if you can’t be there, read the gospel on your own knowing that you are not alone. And yes, I did give out certificates (although the pink did not print since I didn’t use a color printer). Cause who doesn’t love having something simple to help celebrate the accomplishment?